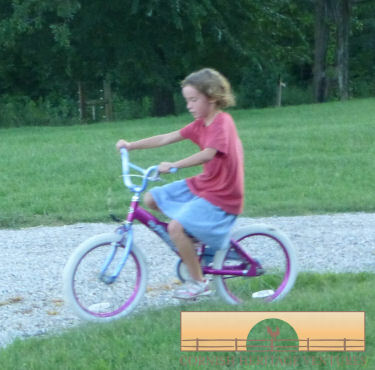 Between coming back from England & heading to Maryland, Daniel learned to ride his bike. 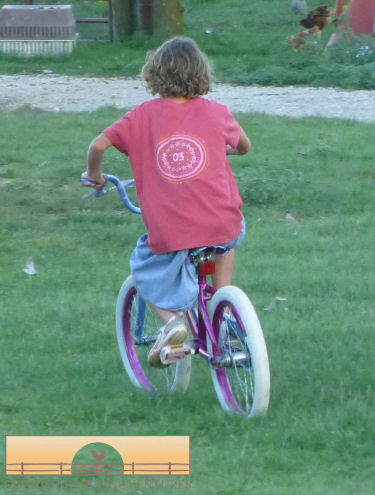 Hannah had not really shown much interest in riding a bike but of course was now feeling left out. Knowing Hannah as we do, we knew it was no good pushing/helping her as it would end in tantrums & tears. In fact I did try it in MD & it ended in just that plus I stood on a honeybee in the grass & got stung for my efforts! SO when we got home we just encouraged her to practice. She would go out for a few minutes & then come in screaming because it was not working. The bike was stupid & she was never going to ride again etc. This went on for several days. This past Monday I was trying to take a 10 minute nap after reading to them & nearly falling asleep. I probably only got 2 minutes when I hear “MUM! MUM! Come look!” Hannah was riding her bike 🙂 Whoo Hoo!